How Do I Activate Google Webmaster Tools? Posted October 17th, 2014 by Katrina Crowell & filed under SEO. Discover how to connect Google Webmaster Tools to Google Analytics so that you can access more reports about how people are accessing your website. Posted February 24th, 2013 by Rich Brooks & filed under Blogging, SEO, Web Marketing. If you’re using Google Analytics, but some of the reports won’t display, you may need to enable Google Webmaster Tools…. Stay ahead of the competition…never miss another update! Want more leads? We wrote the book on the subject! Grab your copy now at Amazon! 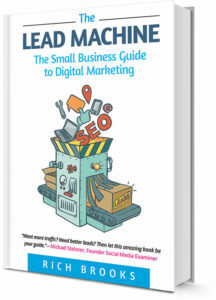 Comprehensive, Practical, Easy-To-Read Strategies for Digital Marketing. Recommended Reading for Small Business Owners. Simple Yet Comprehensive Digital Marketing Guide for Entrepreneurs - With Steps and Links. The steps for success are clearly laid out and easy to understand. A to-the-point comprehensive roadmap to digital marketing genius!